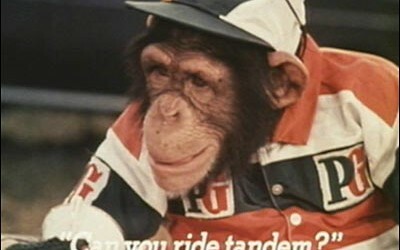 In 1956 PG Tips began using anthropomorphic chimpanzees in their TV advertisements. These were dressed in human clothes and were known as the ‘Tipps family’. Their voices were often provided by celebrities, such as Peter Sellers and Bob Monkhouse. By 1958 PG Tips had risen from fourth to first place in the British tea market. The chimpanzees were from Twycross Zoo in Leicestershire. These advertisements were stopped in the 1970s after complaints by animal rights organisations. However sales dropped and the chimps were bought back 18 months later. The last ‘Tipps family’ advert was broadcast in 2002. The PG Tips chimps spawned a spin-off in memorabilia, including trading cards and figurines.